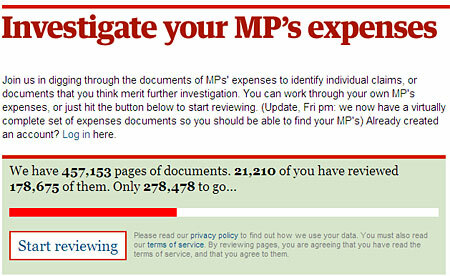 In a supersized version of crowdsourcing, the Guardian is asking its readers to sift through MP expense documents released by the UK government and pull out interesting nuggets and key facts. The info goes into the Guardian’s Data Blog, which keeps a running total of some of the more eye-brow raising receipts turned in by the MPs. According to the latest stats, it seems the lawmakers spend a lot of time in the kitchen. Or at least having it decorated. 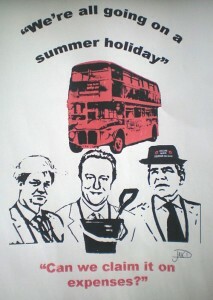 Is the Busman’s holiday over for UK MPs? Having returned from the UK for a short break and being bombarded with increasingly extraordinary claims by our MPs for expenses I thought the ISN blog would benefit from some insights into the worst, most ridiculous and decidedly unfortunate examples. Former Conservative MP Derek Conway paid his sons Henry and Freddie £80,000, and although after investigation he paid back £16,860, further enquires found that he made payments totaling £260,000 to his immediate family over a six year period. Five Sinn Fein MPs who refuse to sit in Westminster because they will not swear an allegiance to the Queen claimed over £500,000 in expenses for renting three properties in Westminster at three times the market rate according to local estate agents. Labour MPs Alan and Ann Keen took out a joint life insurance policy worth £430,000 and then claimed back the £867.57 monthly premiums on their expenses. An unnamed Conservative MP claimed £380 for more than 500 bags of horse manure. Another Conservative MP, David Willets, claimed £115 to have 25 light bulbs changed by an electrician for his second property. Liberal Democrat MP Chris Huhne claimed £82.35 for the mounting, framing and inscription of a photo of himself – not for his constituency office but for one of his seven homes. Labour immigration minister Phil Woolas claimed £2.67 for feminine hygiene products and £15 for a lady’s blouse. Arguably his worst mistake was not realizing that he could have tagged these ‘personal costs’ onto his £400 monthly food allowance and saved himself the embarrassment. That was an error carefully avoided by many MPs who make the full food allowance claim even during recess when they are unlikely to be away from their main homes. Labour MP Jacqui Smith’s husband claimed two blue movies on her expenses and expected the taxpayer to foot the bill. Should MPs be able to claim thousands of pounds for televisions, stereo equipment and swimming pool cleaning, and be able to submit claims for sundry expenses up to the value of £250 without receipts? I don’t think so. Is an MPs ability to do his job enhanced by having a 42 inch Sony TV rather than one from a less ‘prestigious’ manufacturer? Again it is hard to argue that brand names contribute to productivity. But it is the ways in which MPs have managed to subvert the rules for their own advantage which grates most strongly with me. The Telegraph has published an overview of the ways MPs have played the system – for instance by renovating properties with taxpayer money and selling them at a profit.